At this time of year, the sound of autumn is for many characterised by an elusive chattering and ticking from deep within the thicket or hedge. The call of the Wren, explosive in its nature, belies its tiny size and is a hint to why for many thousands of years it has held an elevated position in the hierarchy of birds. It is the King of the Birds, celebrated on St Stephen’s Day, the ubiquitous companion to wood and garden and a master-singer – familiar to all. 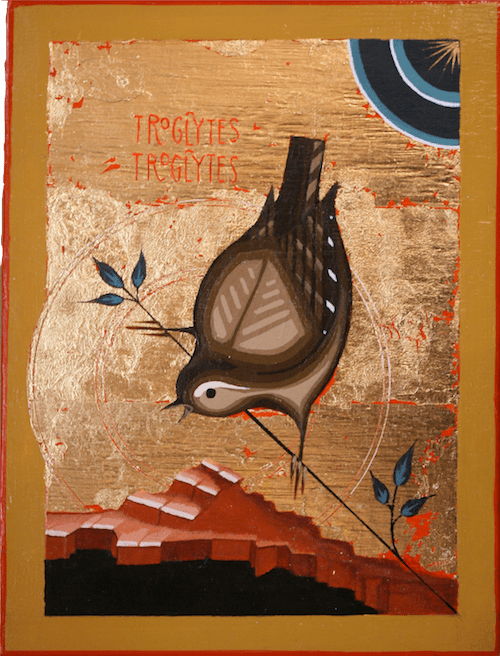 As its taxonomy suggests the Wren in this painting is indeed the cave dweller, an axiomatic form that also has a peculiar and wonderful resonance with the early Russian iconographers. The full voice of the bird is summoned from the darkness.. by the leaf of autumn, the bud of spring or the unfurling clouds of Heaven.